For I know the plans I have for you…to give you a future and a hope. Everybody in Jericho had heard about the miracles of Israel’s unstoppable God, and a good percentage of those who heard likely believed that the events had really happened. But, so far as we know, in all of Jericho, only Rahab acted on that belief. Now then, please swear to me by the Lord that you will show kindness to my family, because I have shown kindness to you (Joshua 2:12). At its foundation, Easter faith is an unshakable belief that God is both ultimate power and ultimate goodness. In some unfathomable way, Rahab, knew this. Therefore, she was willing to stake not only her welfare, but that of her family on a God she had only heard about. … Give me a sure sign that you will spare the lives of my father and mother, my brothers and sisters, and all who belong to them, and that you will save us from death (Joshua 2:13). 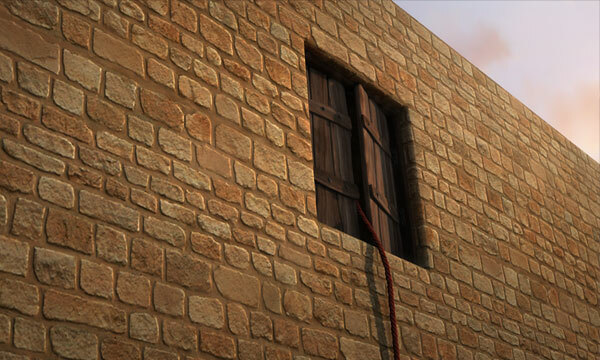 The spies instructed her to gather her family together in her home and tie a scarlet cord to her window as a sign to the invading Israelite army that they were to spare all in the home. And it was so. …but Joshua spared Rahab the prostitute with her family and all who belonged to her, because she hid the men Joshua had sent as spies to Jericho… (Joshua 6: 24-25). That is another quality of Easter faith: it is a single-minded journey. The spies, the fall of Jericho, the hair-raising escape—this was not just a fascinating tale that Rahab re-counted to friends on winter nights, sitting around the campfire in some near-by, Canaanite-friendly town. While there is no record of what happened to her family after their escape from Jericho, for Rahab it was the beginning of a new way of a new life. A way of life that must have had a pretty steep learning curve for one from a spectacularly pagan culture. But above all else, Rahab desired to know and serve a great God who parted the Red Sea, brought down mighty armies and found a forever home for a former prostitute.